This page of the Environmental Literacy Council site provides access to a collection of professional development materials for middle- and high-school science teachers: five downloadable modules on biodiversity; climate change; earthquakes, volcanoes, and tsunamis; radioactive waste; and genetically modified crops. The modules are intended to build skills in critical thinking and analytical reasoning about these issues. Each includes background information detailing the environmental context of each topic, recommends supplementary texts and online teaching resources, and suggests activities. The modules may be downloadable from the site for free; they are also collected into a paperback (189 pp.) for purchase from NSTA Press. 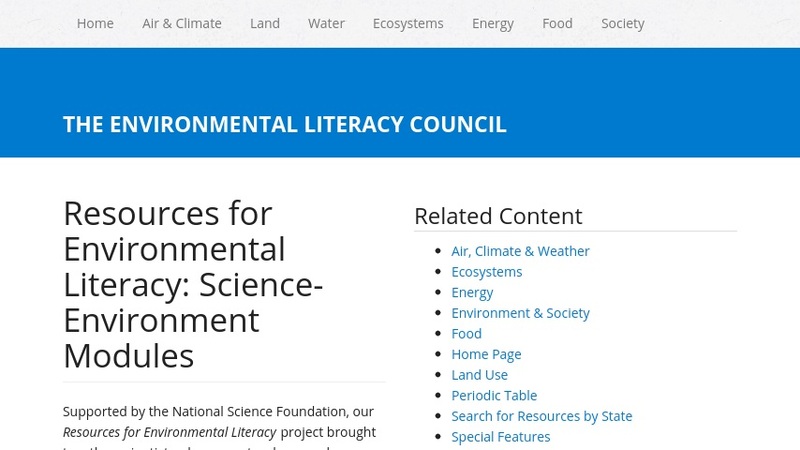 The page also connects to additional ELC teaching materials on air and climate, land and land use, water, ecosystems, energy, food, and environment and society. These resources feature an overview of the topic and include extensive lists of relevant online materials.